Welcome to the Holiday Gift Guide and thanks for stopping by. I’ve got some great gift ideas to share with you this holiday season so make sure to check back often. Don’t forget to see what Casey has to offer today at A Couch With A View too. Children and families nationwide need not wait until Easter for a visit from their favorite rabbit! One of the most beloved family tales of all time returns in this enchanting combination of live-action drama and animated adventure. The Velveteen Rabbit tells the story of a boy named Toby who is sent by his busy father to spend the holiday season with his stern grandmother. Toby?s world instantly brightens when he discovers the house?s ?magic attic,? where three forgotten toys ? including a special stuffed rabbit ? unlock an imaginative world that will change all their lives forever! Starring the voice talents of Jane Seymour, Tom Skeritt and Ellen Burstyn, this charming and unforgettable classic will be a gift to treasure all year long. The Velveteen Rabbit is an all time classic. It’s a tale of friendship and adventure like no other. I remember reading the book when I was young and I am so excited to be able to share the memories with my children. This all new movie is so much better than the books I’ve read and I just love what they’ve done! 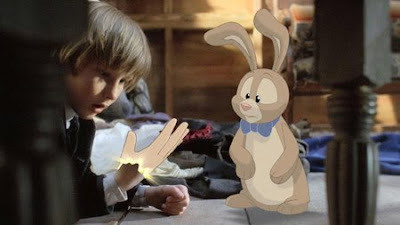 The scene above when Toby wishes the rabbit to life is one of our favorites. It goes from sad and real to happy and cartoon in just an instant. It was wonderful to see his whole world light up from the darkness that it once was. I think they did a wonderful job in the recreation and we will treasure this movie always! 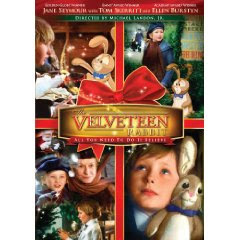 The Velveteen Rabbit is a great last minute gift or stocking stuffer idea. You could even buy it just for the heck of it for a family movie to watch on Christmas! A big thanks goes out to The Velveteen Rabbit and Grand Communications for participating in this event! I was given a DVD copy of this movie for the purpose of reviewing. Opinions expressed are my own or my families and are not influenced by any form of compensation. Take it or leave it. Click here to view my full acknowledgment policy. Aw, wow! I remember having this read to me when I was younger.